Ends Tonight! save over $900 on amerisleep bed packages . free shipping on all orders! White Glove Delivery is the simplest way to get your sleep setup into perfect working order. We’ll ship your adjustable bed to a White Glove Agent in your area. They will contact you to schedule an appointment to setup your adjustable bed. This includes, bringing your adjustable bed into your bedroom, setting it up and removing any debris from the setup. Please note: Your mattress will shipped to you and arrive before your adjustable bed. Ensure that you have your mattress before scheduling your setup appointment. Our Extended 10-Year Full Replacement Warranty is provided by Amerisleep. This warranty will include repairs or replacements for faulty welds, mechanisms and steel frames, as well as electrical component failure including wiring, motors and remote controls for the first ten years from the original purchase. This warranty will be included with your adjustable bed package warranty. Amerisleep will automatically register your adjustable bed after you place your order. Please allow 24 hours after the original purchase date to receive a separate confirmation email for the warranty. We're here to make sleeping easy and hassle free. When you order from us, we'll ship to you for free. 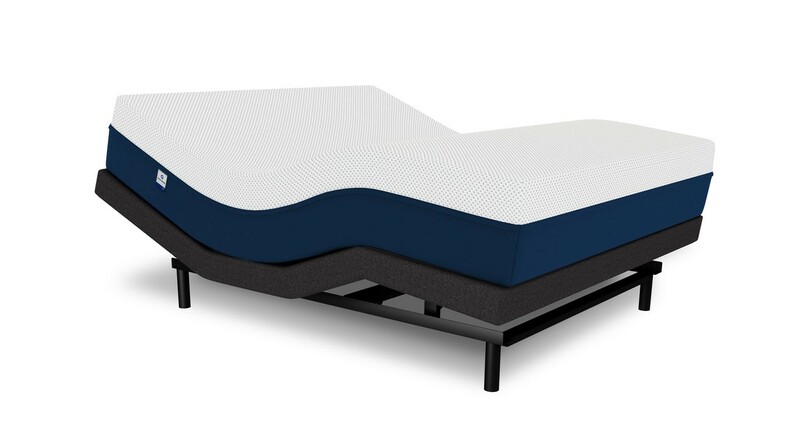 The Amerisleep Bed Package is the pinnacle sleep experience. Featuring your choice of Amerisleep mattress—ranging from soft to firm—and the Amerisleep Adjustable Bed, this experience will have you snoozing in record time. Backed with a 10-year extended warranty and white glove delivery, we'll have you sleeping soundly for years to come. Adjust your bed to the most comfortable position effortlessly. This touch remote offers many features including a pillow-tilt, programmable positions and a snore button. A table-top holder keeps your remote within reach. The fully adjustable, dual wave massage offers variable intensity for extreme relaxation from head to toe. While other adjustable bases lift you away your nightstand - this exclusive Wallhugger® engineering lifts you up while simultaneously gliding you back. Multi-directional under-bed lighting is fully dimmable, providing both ambience and functionality. Press some buttons. The good kind. Place your mouse over the buttons to learn more about each feature. Touch the buttons to learn more about each feature. Press and hold to raise head to the preprogrammed position. Head will automatically lower to flat after 15 minutes. *To program a position, adjust base to desired position, press and hold the set button until the massage motors turn on and off, then press and hold the Snore button until the massage motors turn on and off. Press to turn underbed light on. Press again to turn underbed light off. Press to lock remote control. Press again to unlock remote control. Press and hold to raise or lower the head section. Press and hold to raise or lower the pillow tilt s ection. Press and hold to raise or lower the foot section. Press and hold to program M1, M2 and Snore presets. Press and hold to adjust base to the programmed position. *To program a position, adjust base to desired position, press and hold the set button until the massage motors turn on and off, then press and hold the M1 button until the massage motors turn on and off. *To program a position, adjust base to desired position, press and hold the set button until the massage motors turn on and off, then press and hold the M2 button until the massage motors turn on and off. Press to increase or decrease massage intensity. Massage has 3 speeds: Low, medium and high. Massage will automatically shut off after 15 minutes. Press “on” to turn both massage motors on. Press “off” to turn both massage motors off. Press and hold to lower the base to the level position. Fall asleep as easy as one, two... zzz. Click on the options to determine which mattress is right for you. A showroom doesn’t know you like your bedroom. Try your mattress for 100 nights and if you don’t love it, we’ll help you donate or recycle your mattress and give you a full refund. Please Note: Our 100 night sleep trial is not available for our adjustable beds. Trying a mattress in a showroom has been proven† to not help in the final satisfaction of the purchase. We’ve solved this problem by giving you 100 nights to truly test your bed. Within those 100 nights, if you’re unsatisfied with your rest, call us and we’ll work with you to donate or recyle your mattress and give you a full refund. Every mattress is protected by a 20 year warranty so you can rest easily. We offer full repair or replacement for the first 10 years and a pro-rated warranty for the last 10 years of your mattress’ life if it is judged to be defective due to workmanship or structural defects. This does not cover a normal increase in softness or decrease in the slow recovery of the mattress as these don’t affect the pressure-relieving qualities of the mattress. Your Amerisleep Adjustable Bed is backed by a 20 year manufacturer warranty. This will protect against defects in materials or workmanship. Your warranty only applies to the original purchaser. The warranty registration card, included with your adjustable bed, MUST be returned within 30 days of receipt of the product. Learn more about how our warranty protects you on our Warranty Information page.